Lee Min-Hyeok poses after beating Miguel Alo. MANILA--South Korea went 2-0 against the Philippines in the main matches of Fight Night 3 at the SM North EDSA Skydome in Quezon City on Sunday night. Lee Min-Hyeok and Kim Jae-Woong's brilliance in the grappling game turned out to be too much for their Filipino foes as the South Koreans swept the two key bouts in the said fight card. 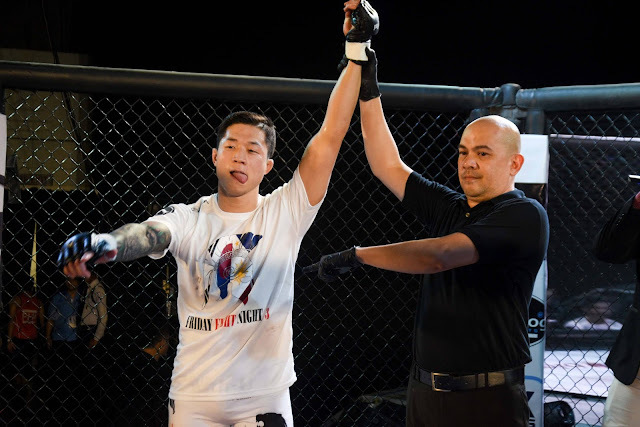 Although failing to complete the submission, Lee was still able to slow down Miguel Alo and eventually took the unanimous decision win. In fact, Lee said he was satisfied with the result. "I am happy with my performance against a veteran of the sport like Miguel Alo," said Lee. Meanwhile, Kim completed a submission of his own against Dennis Domingo. Just 72 seconds into their match, Domingo tapped out after Kim achieved a rear naked choke.